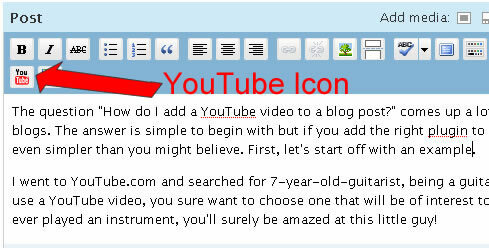 The question “How do I add a YouTube video to a blog post?” comes up a lot when talking about blogs. The answer is simple to begin with, but if you add the right plugin to your WordPress blog, it’s even simpler than you might believe. First, let’s start off with an example video that I searched for on YouTube. No, this isn’t my boy, just someone I came across from searching. Hope he appreciates the video views we’ll be bringing his way! 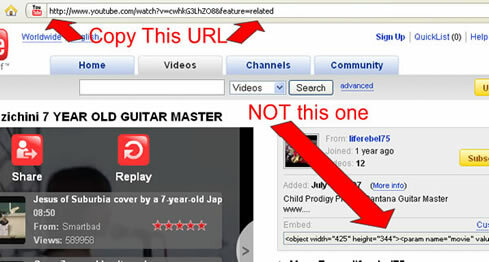 [youtube]http://www.youtube.com/watch?v=cwhkG3LhZO8&feature=related[/youtube]I went to YouTube.com and searched for 7-year-old-guitarist, being a guitar player myself. 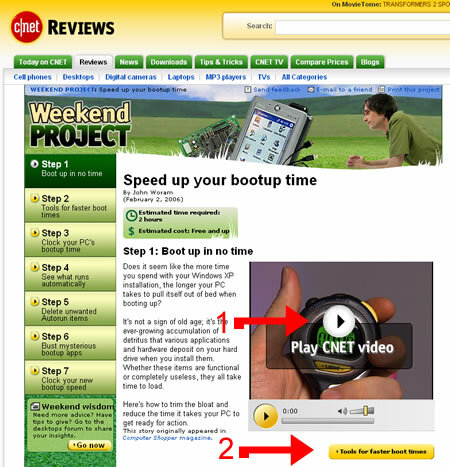 When you use a YouTube video, you sure want to choose one that will be of interest to your viewers. If you’ve ever played an instrument, you’ll surely be amazed at this little guy! Then I clicked my mouse in the position I wanted the video to appear on my page and then clicked on the YouTube plugin icon that I installed when my blog was originally setup. Notice when I clicked on the plugin icon, a little window pops up. That is where we’ll add the video’s location. By returning to the video page on YouTube, I can now select (“copy”) the visitation URL (Do NOT choose the embedded code) as shown in this next photo. So that’s how I added this YouTube video to my blog post. And, with the proper plugin, the entire process takes mabye 10 seconds or so. With that in mind, I encourage you to start adding YouTube videos to your blog posts. Why? Because using the right video will capture the attention and interest of your readers. And, that’s probably 70% of what good blogging is all about. As part of my blog diary, I wanted to post my first YouTube video within my blog. So, I started an account at YouTube.com and uploaded this mpg file of my 9-year-old surprising a ski instructor during a nastar race at Copper Mountain, our favorite weekend skiing hangout during the winter months. I’ll be making more comments about what I do with this video (and others), but this is the starting point. This is the first time I’ve uploaded anything to YouTube and I was amazed how easy it really is. YouTube allows for tons of different video formats, so you really don’t have to worry about preparing your video file. I’ve not usually been very impressed with the quality of YouTube’s video output, but I can see now that the video owner is the one that is more in control of the quality. So, I’ll be experimenting with that more. What has your experience been posting YouTube videos? Post yours here in the comments area along with your experience.